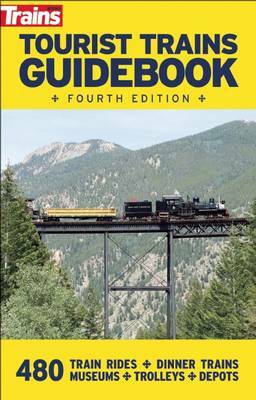 The Tourist Trains Guidebook is a passport into the exciting world of heritage railroading. It puts readers on the right track for riding historic steam locomotives, taking in breathtaking scenery only visible from the rails, and stepping into the past. The fourth edition of the Tourist Trains Guidebook follows the same successful, user-friendly format as its predecessor. It thoroughly describes nearly 500 excursion trains and railroad museums throughout the United States and Canada. About 200 of the most popular sites are presented in full-page reviews written by a knowledgeable Trains magazine editor or correspondent. Reviewers offer advice on what to see, when to go, and how to get there. The remaining listings highlight smaller yet interesting train rides, museums, and depots that provide family fun or a unique piece of railroad history. Sites featured also include general directions, locator maps, and websites to give the reader the most user-friendly resource.